With the fiscal cliff only two weeks away and the upcoming holiday season, negotiations for replacing the fiscal cliff with a sensible deficit reduction plan appear to have accelerated. Over the weekend, Speaker Boehner reportedly made an offer to the White House that included $1 trillion in spending cuts and $1 trillion of revenue – with some of it coming from letting the upper-income tax cuts expire on millionaires. Yesterday, the White House responded with a third offer, again lowering the revenue in their proposal, now down to $1.2 trillion and backing off their requirement to raise rates on incomes over $250,000. Their proposal now would require the very top rate to rise from 35 percent to 39.6 percent, affecting income over $400,000. The White House has now included the chained-CPI in their offer, and with both parties willing to put that option on the table, it seems likely to be included in the final deal. Both sides are now closer than in their original proposals and there does appear to be renewed hopefulness that a deal will get done. Importantly, the figures below are based on our best understanding of the offers from press reports, and may differ from the actual offers. In particular, there is a lack of clarity on many of the details of the White House’s latest offer. * We assume the WH Offer 2 is identical to WH Offer 1 except with $1.4 trillion of revenue. + We assume GOP Offer 1 is based off of the numbers suggested by Bowles to the Supercommittee applied through 2022 instead of 2021. ^ Includes discretionary and related interest savings enacted since the August 2010 baseline, but excludes cuts used as offsets.
' Press reports indicate that GOP leadership has proposed letting the tax cuts expire for income above $1 million. Letting all the tax cuts expire for income above $1 million would raise roughly $450 billion while letting only the top rate go to 39.6 percent would raise in the broad range of $250 billion. > Some reports include a permanent extension of tax extenders, which could have substantial additional costs. 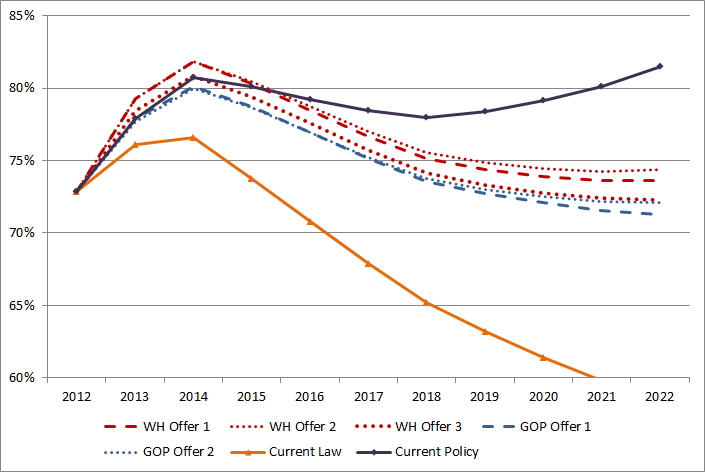 We assume only two years of deficit financed extenders at a cost of $100 billion. That both sides have moved closer together is a very welcomed development. Though both sides reduced the total amount of savings in their second offers, it is encouraging that the latest offer from the White House appears to have increased the total savings. Lawmakers went through this process last year during the Super Committee negotiations when offers became smaller, so it's good to see that this process might not be repeated. In the end, however, most offers up until this point would just barely stabilize the debt within the budget window – leaving little room for error. While policymakers should be realistic about what can specifically be agreed upon before the cliff, we hope that negotiations will lead them to a bigger and bolder package rather than a smaller one. As we’ve explained, such a deal should "go big" in order to put the debt on a clear downward path, should "go smart" by replacing the mindless recessionary policies of the cliff with a gradual, intelligent, and pro-growth set of policies, and should "go long" by making substantial improvements beyond the ten-year window. There may not be enough time to agree on a specific plan, but policymakers should at least agree on a framework, a downpayment, and a credible process for putting in place the remaining savings next year. As negotiations continue, we will continue to track them and offer analysis. Note: Table updated since original posting to incorporate new details about the White House's latest offer.